So how should a bra fit? A wrong fitted bra can be the cause of a surprisingly diverse amount of problems. Not including the obvious discomfort, it can also bring you neck, shoulders, back and also breasts pains. It is extremely hard to find a bra that fits properly if you’re not aware of how to measure your size, how to be sure it’s the one for you, and how to face the eventual problems you’ll encounter while trying them on. It’s time to change that once and for all and find the perfect bras you deserve. Measuring is the first step. The band size is measured by wrapping a tape around your rib cage, tightly. You should round it up to the nearest even number. It’s better if it’s a bit too big than too tight, as you can adjust that later on.You will find your cup size by measuring your bust. A good tip that should be more famous but sadly isn’t is to measure your bust bent over. It will keep you from having the size wrong by getting all the breast tissue in one measurement, meaning all the skin and fat in the back that you won’t get standing up but that still matters once you’re wearing the bra. To be sure you got it right, the best thing is to also take a measurement while standing: that way, if you have saggier breasts, you can make sure bending over didn’t overestimate the cup size. 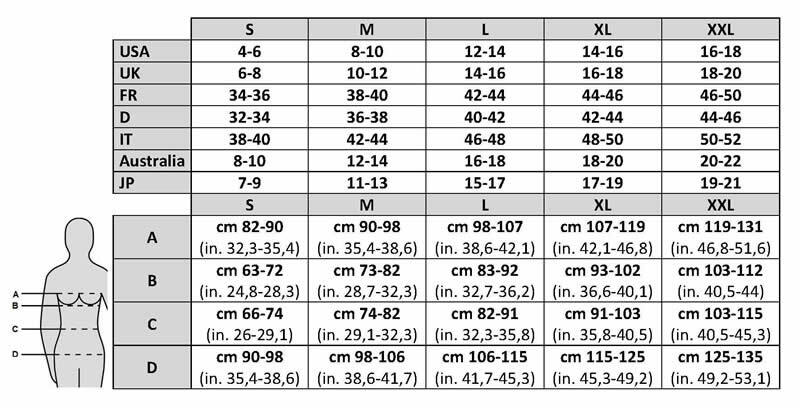 Once you have the two sizes, you should find a chart that will give you the corresponding combination of number + letter you need to pick the right bra. As bra fitting is an international mess, stick to one chart, preferably the European or UK one, as most quality brands go by those. Step two is actually trying bras on. The size you found is an indication, but it might not be the exact one you need. Don’t worry, it’s a good starting point. The estimation and the bras you try on will help you find the proper fit. You also need to think about the shape and brands of the bra you want, considering it will change from one company to the other. Despite that, once you’ve remembered the basics of how a fitting bra should look like, you’ll be fine. The main things that should be happening while wearing the right bra for you are those: the band should be parallel to the ground, the cups should cover your entire breast without flapping on one side or the other, the center gore (the piece of metal between the two cups) should be flat on your chest, and the straps shouldn’t dig in. It might sound impossible, but these kinds of bra do exist for you! The problems that often come up all have solutions. Don’t forget: as you try them on, make sure to move around, jump a little, raise your arms etc. so that you’re sure it’s holding you right. Step three is confronting the problems that might come up and finding solutions. If your band is digging in: you need to either change shape or brand, or pick a bigger band size. The band that should be supporting your breasts is too small. If your band is not parallel to the floor or too loose: logically enough, go down a band size or change the cup size. You might have to change both if it’s much too loose. You need to know the cup and band size coexists with each other, and sometimes going down or up one means changing the other too. For example, if you go down a band size, you’ll probably need to up the cup size. If the band is riding up your back, which is uncomfortable and definitely not what you want, try loosening the straps or adjusting the hooks. A tip: you should always start with the loosest hook. The bra will extend once you’ve worn it a lot and washed it and you’ll need the tighter hooks then. They aren’t here to tighten the grip on your breasts!If your breasts are spilling out the cups, increase the cup size, and/or the band size.If the straps are digging in, try to loosen them (obviously), and if you’ve reached maximum, then choose a wider bra or different straps. Some bras have removable ones, you can aim for those and pick the straps that are right for you after that. If the sides are too tight, you’re also looking for a wider style or a bigger band size. With all of that in mind, it’ll be much easier for you to be sure you’re wearing the right thing and to avoid losing money by being ill-fitted underwear. Now that you know exactly what to do, you’ll have much more time to focus on looking pretty and picking the designs and shapes you want. One last tip for the road: never put your bras in the dryer, at it will damage the structure and drastically shorten its life. If you can avoid it, always do!